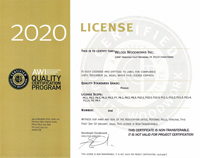 The AWI Quality Certification Program (QCP) is a valuable quality assurance tool that ensures that interior architectural woodwork meets the project's specifications and industry standards. It enables design professionals and building owners to substantiate the competence of architectural woodwork manufacturers on a project-specific basis. 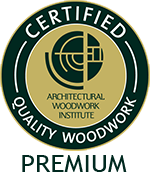 Certification credentials are earned by woodworking firms who, through comprehensive testing and inspection, demonstrate the ability to fabricate, finish and/or install work in accordance with the quality grade criteria set forth in the Architectural Woodwork Standards (AWS). Learn more about the Architectural Woodwork Institute. We specialize in design, fabrication, and installation of wood, plastics, plastic laminate, metals, glass, and stone projects requiring the highest level of attention to detail. We are committed to Quality projects delivered on schedule and on budget. Submit your plans and specifications to us for your next project requiring top quality execution by a Full Service Architectural Millwork Provideer. We've been providing AV related furniture and fixtures to AV integrators and government for over fifteen years.